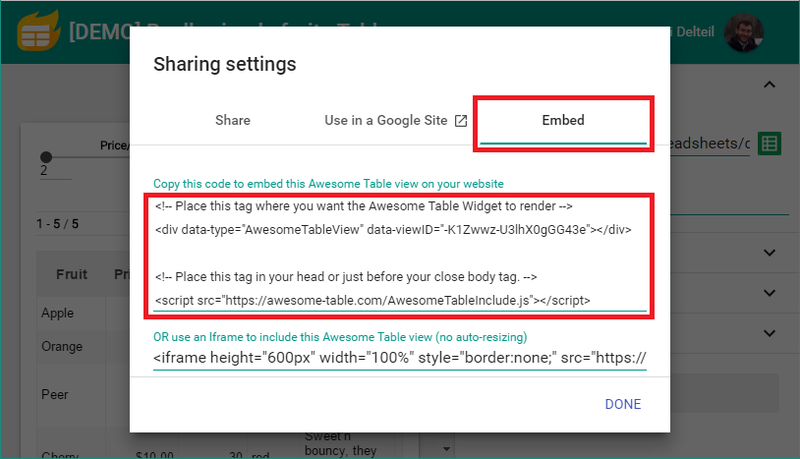 In this article, you will quickly learn how to insert an Awesome Table view on any website (other than Google Sites) with just a few steps. Prerequisite: Before beginning this tutorial, you should already have an existing view you can use. To learn how to create a view, please read our basic configuration section. For this method to work, you need to have admin / editing access to the website since you'll be inserting HTML code and scripts. You can now insert this HTML snippet in your website. You can embed more than one Awesome Table view on the same page, but the script tag only need to be inserted once ! Do not use this in a Google Site ! Read our documentation to include a view in a Classic Google Site or a new Google Site.